I like to try to get a handle on the holidays early. You know, have my to do projects planned out, pinned on my holiday pinterest board. I like to know I will not be in a tailspin leading up to the 25th and that I can just sit back and enjoy the season. Please don’t roll your eyes at me because this is not how my holidays actually play out. I have high hopes every year but I usually end up calling my sister saying their gifts should have been there by now knowing full well that I am currently wrapping my nephew’s gift cards that I just picked up while on line at the grocery store. I’m sure many 12 and 15-year-old boys would be happy to wait a little longer for a cracker barrel or home depot gift card. Every now and then I do manage to pull off a holiday coup. Last year I made my husband an advent gift bag calendar. I had been wanting to do something like that since our first Christmas together and by golly 13 years later I sort of did. I made him 24 different little gift bags as a countdown with sundries and such. One day it was orange tic tacs which he loves, a gift card to i tunes, a note to meet me for hot chocolate or for a night of cheese and crackers and watching Emmet Otter’s Jugband Christmas. Of course there was the day I panicked because I had no gift ready and just put the two dollars I had in my wallet in the gift bag. Despite that one blip in the countdown I was rather pleased with how it all came together. So I have hopes that this Christmas season will have some success in the pre-planning as well. I have lots of big ideas again all pinned and ready for me to take the reins. I want to try new cookie recipes for the cookie bags we give to our co-workers. I had the idea of having a virtual cookie swap or holiday party with you guys, let me know if anyone else wants to do something. I even thought of a 12 days of dessert to bring to work but my husband thinks that I may make myself crazy with that so we will see. It’s usually around this time I think I should test new desserts for Christmas dinner but then I usually never do. Well I did! 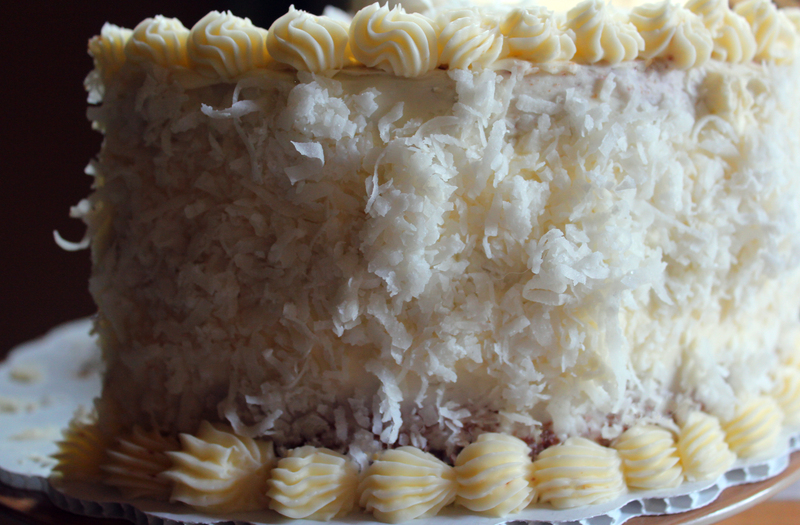 I found this in Sky High irresistible Triple-Layer Cakes and thought it would be a nice addition to a holiday meal. 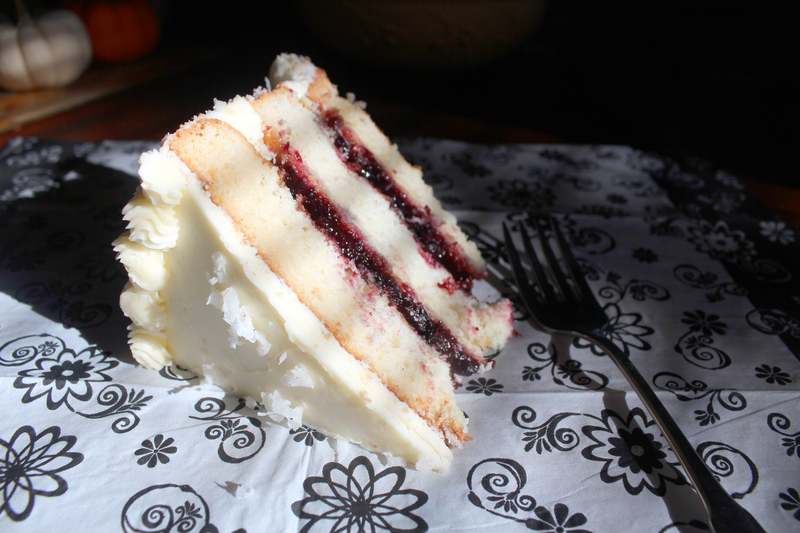 The cake is delicious and light but with some substance. The filling is the star of the cake. The vanilla blends well with the cherry and cranberry for a nice tart taste. 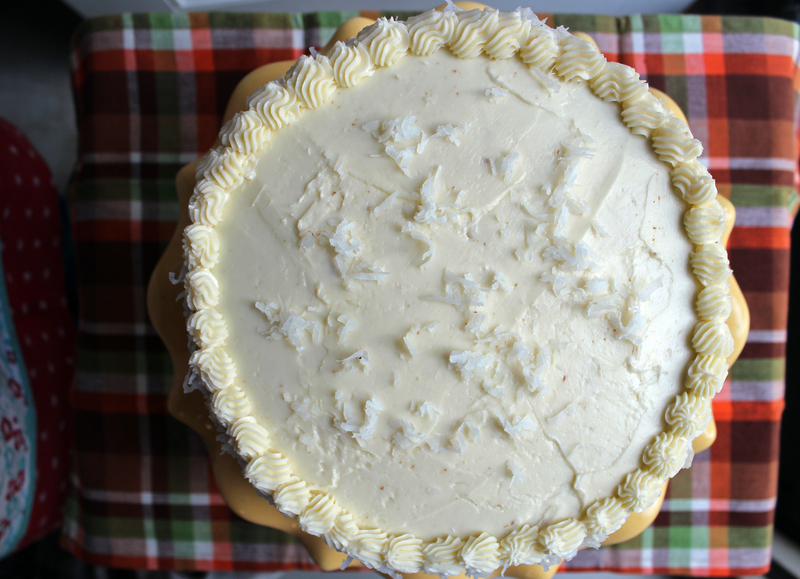 I made this with an almond swiss buttercream but would definitely use a cream cheese frosting next time. I’m afraid I am just not buttercreams biggest fan so maybe you will like it as is. So fingers crossed that I can keep this pre holiday planning and doing going and when you feel overwhelmed by it all have some cake and remember it’s not suppose to be stressful even though it is and you panic and give your husband two dollars! Preheat oven to 350 degrees. Line the bottoms of 2 ungreased 9 inch round cake pans with parchment paper, do not grease. Sift together flour, 1 cup of sugar and baking soda, set aside. In a large mixer bowl, whip egg whites with the cream of tartar until frothy, slowly add remaining 1 cup of sugar and whip until soft peaks form. In a large bowl whisk the buttermilk, oil and vanilla until blended. Spoon 1/4 of the egg white mixture on top of buttermilk mixture, then sift 1/3 of flour mix on top. Fold gently together and repeat steps two more times ending with remaining egg whites. Divide batter between three prepared pans. Bake for 20-25 minutes or until tester comes out clean. Cool on wire rake in their pans at least one hour before running a knife around edges and carefully turning out and removing paper. Prepare preserves while cakes are baking and cooling. 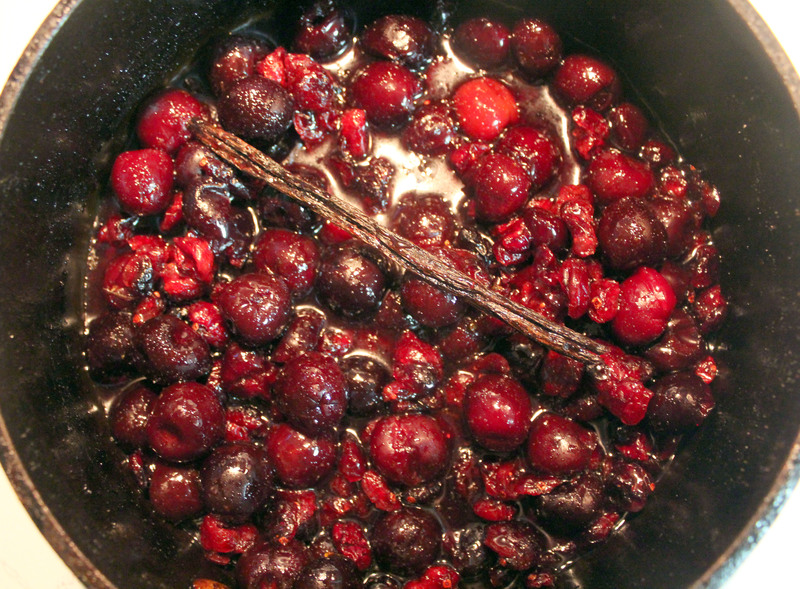 Place cranberry, cherries, sugar, orange juice and zest into a nonreactive saucepan. Scrape vanilla seeds out of bean and add to pan putting the pod in too. Bring to boil over medium heat, stirring to dissolve sugar. Reduce heat slightly and continue to boil until preserve thicken, 15 to 20 minutes. Remove from heat and discard vanilla bean pod. Let preserves cool completely. Cover and refrigerate until ready to use. Whisk egg whites and sugar over a bowl over a pot of simmering water. Whisk until sugar dissolves and then transfer to a mixer bowl. Whip until the eggs double in size and turn white. Add almond then add butter and whip until it all comes together. 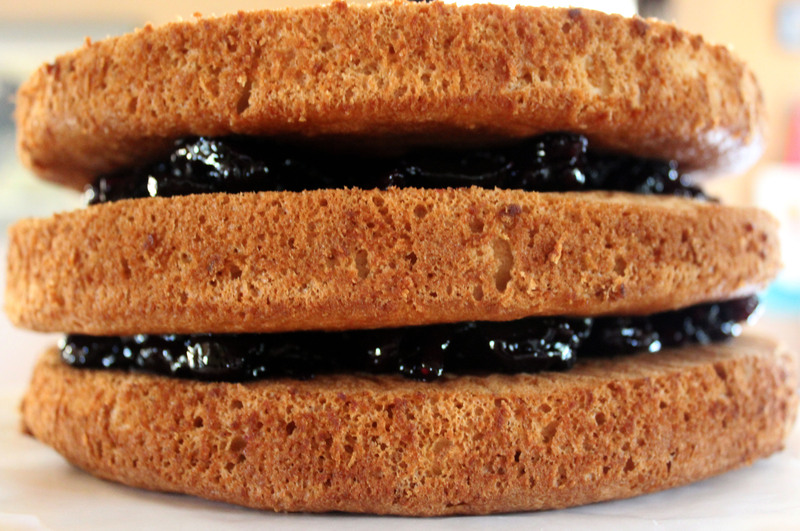 To assemble the cake, put one layer flat side up on a cake stand and spread half the filling leaving a 1/4 inch margin around the edges. 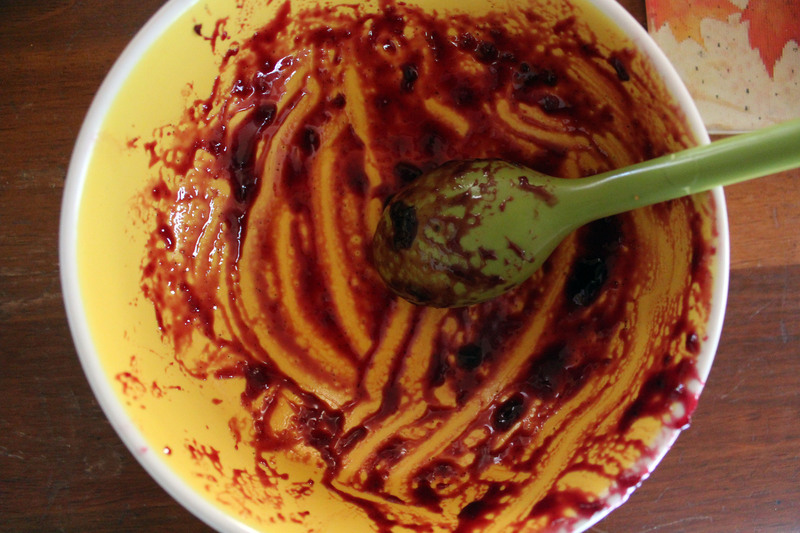 Top with second layer and repeat with remaining preserves. 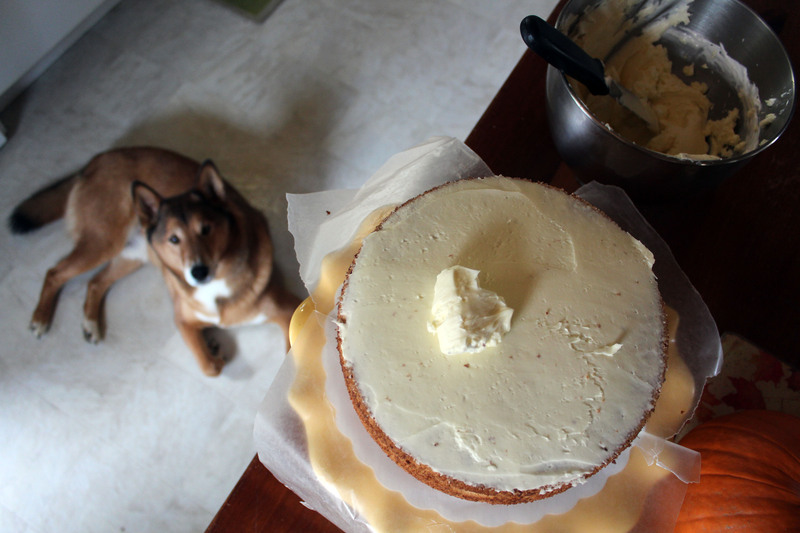 Place third layer in place and frost sides and top with buttercream frosting (or cream cheese!) and decorate it like you would like. Add some coconut if you would like too. Enjoy! That’s a very fine cake indeed.